What began as a modest hotel in 1911 was almost immediately expanded with intention of transforming it into a world-class resort. Adopting Queen Anne style with furnishings from Wanamaker's in New York City, this expanded hotel opened for the 1912-1913 season as the Gasparilla Inn. Tennis courts, a casino (for balls and parties not gambling), a beach club, a golf course, and a croquet lawn soon followed attracting both wealthy northerners and dedicated fishermen, most arriving by train. Further expansion and enhancements, this time in Neoclassical style, increased both the inn's profile and that of its guests, who included J.P. Morgan, Henry duPont, and Florida railroad and resort tycoon, Henry Plant as well as a collection of Cabots, Drexels, and Biddles. Now on the National Historic Register, the Inn has expanded to 142 rooms, 61 in the inn, another 81 in 17 cottages. Pete Dye was brought in to create an 18-hole golf course, and there were subsequent additions of a large marina as well as a spa and fitness center. Tennis grew to seven Har-Tru courts, which since 1987 have been managed by pro Jinx Howe. Howe played for the University of Tampa and competed in Virginia Slims events before going on to complete a Master's in Sports Medicine at Northeastern University. 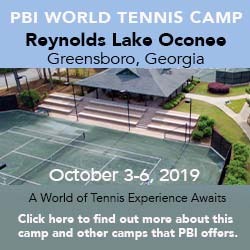 She and her husband, Mark Horan, have quietly seen to the needs of some 300 beach and tennis members with weekly adults and kids clinics, men's and ladies' days, and occasional weekend round robins. Activity reaches a zenith during the social season from late December into April. "It's a relaxing spot," says Howe. "We can get people matches, which is a big part of our job. It's a beautiful spot for all ages." General Tourist Information. For general information about visiting Boca Grande, check out the Visit Florida website. So far, I haven't received any written feedback on Gasparilla Inn & Club. If you've taken a tennis vacation there, I'd like to hear your reactions.